Please tell me that isn't a soybean that Michelle Obama is extolling the virtues of in that photo. The current First Lady has somehow become the nation's Food Czar, with a capacity of recommending, implementing and apparently enforcing her own policies on the country. No other First Lady has enjoyed such power. Not even the much-beloved Nancy Reagan, who channeled the massive respect given her toward no more a gesture than encouraging America's children to steer clear of drug abuse, was granted such authority to wield. Michelle Obama, however, is hellbent on imposing her own whacked nutritional vision upon the children of those who "just said no". Michelle Obama has directed the United States Department of Agriculture to mandate school lunches that can best be described as "skimpy" and "lacking". Not to mention downright unpalatable. The government is determined to limit elementary kids to 650 calories and high schoolers to 850 calories. Hasn't Michelle ever paid attention to her own children? I mean, elementary kids are supposed to run around and be energetic and that burns up calories. To say nothing of high school students engaged in sports like football and basketball. I was on our high school's swim team and I ate a lot to have fuel for practice and meets: I don't think I could have gotten fat if if I tried during a season. The students are starving, they know it and they also know who's responsible for it. Some enterprising youngsters have even begun operating black markets for such federally-verboten items as chocolate syrup and potato chips. The kids just don't want to be commanded by the government about what they can and cannot eat when their parents are supposed to be in charge of their nutritional needs. One of the obvious consequences? Vast amounts of food getting wasted and thrown away. Nancy Carvalho, director of food services for New Bedford Public Schools, was quoted as saying that hummus and black bean salads have been tough sells in elementary cafeterias. That means even smaller children are going through the day fighting hunger pains, which can never be considered a good thing. One government official tried to put the blame on the students. "One thing I think we need to keep in mind as kids say they're still hungry is that many children aren't used to eating fruits and vegetables at home, much less at school. So it's a change in what they are eating. If they are still hungry, it's that they are not eating all the food that's being offered," USDA Deputy Undersecretary Janey Thornton was quoted as saying. I know of no other way to put it than this: Michelle Obama has become Emma "Ma" Chalmers. But thirty million dollars of subsidy money from Washington had been plowed into Project Soybean -- an enormous acreage in Louisiana, where a harvest of soybeans was ripening, as advocated and organized by Emma Chalmers, for the purpose of reconditioning the dietary habits of the nation. Emma Chalmers, better known as Kip's Ma, was an old sociologist who had hung about Washington for years, as other women of her age and type hang about barrooms. For some reason which nobody could define, the death of her son in the tunnel catastrophe had given her in Washington an aura of martyrdom, heightened by her recent conversion to Buddhism. "The soybean is a much more sturdy, nutritious and economical plant than all the extravagant foods which our wasteful, self-indulgent diet has conditioned us to expect," Kip's Ma had said over the radio; her voice always sounded as if it were falling in drops, not of water, but of mayonnaise. "Soybeans make an excellent substitute for bread, meat, cereals and coffee--and if all of us were compelled to adopt soybeans as our staple diet, it would solve the national food crisis and make it possible to feed more people. The greatest food for the greatest number--that's my slogan. At a time of desperate public need, it's our duty to sacrifice our luxurious tastes and eat our way back to prosperity by adapting ourselves to the simple, wholesome foodstuff on which the peoples of the Orient have so nobly subsisted for centuries. There's a great deal that we could learn from the peoples of the Orient." Ma Chalmers exploits her "friendships" and political pull to bring the bulk of the country's available railroad cars to her soybean collective in Louisiana, while at the same time a record harvest of corn and wheat - more than enough to feed the country - is bulging at the seams in Minnesota... and the farmers have no way of moving it. In Minnesota, farmers were setting fire to their own farms, they were demolishing grain elevators and the homes of county officials, they were fighting along the track of the railroad, some to tear it up, some to defend it with their lives--and, with no goal to reach save violence, they were dying in the streets of gutted towns and in the silent gullies of a roadless night. Then there was only the acrid stench of grain rotting in half-smouldering piles -- a few columns of smoke rising from the plains, standing still in the air over blackened ruins -- and, in an office in Pennsylvania, Hank Rearden sitting at his desk, looking at a list of men who had gone bankrupt: they were the manufacturers of farm equipment, who could not be paid and would not be able to pay him. The harvest of soybeans did not reach the markets of the country: it had been reaped prematurely, it was moldy and unfit for consumption. "Unfit for consumption." That's a good a description as any for darn near everything coming from our "brilliant" leaders in Washington D.C.
Why/how does the USDA involve itself with school lunches anyway??????? 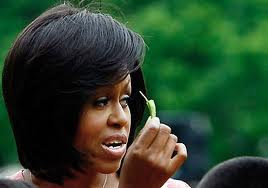 The USDA can do it because Michelle Obama got a lameduck Congress to pass the Healthy, Hunger-Free Kids Act in 2010. That act gave the Department of Agriculture the power to regulate school lunches. Take note that it is NOT strictly "law" per se that is starving the kids. It is instead REGULATION. A law is passed and enacted by legislatures who we elect and are held accountable to the people who elected them. But a regulation is implemented and enforced by officials we do not elect, may never even know the names of, and have no accountability to the citizens at all. Michelle Obama got Congress to give the USDA a blank check to regulate away whatever the hell it wants to regulate. And we can't do a damn thing about it except to repeal the act through "proper" legislative channels. Either that, or defy the USDA and tell Michelle Obama that she can take her regulations and go pound sand. Personally, I like the second option. A little defiance of the nanny state can only be a healthy thing.